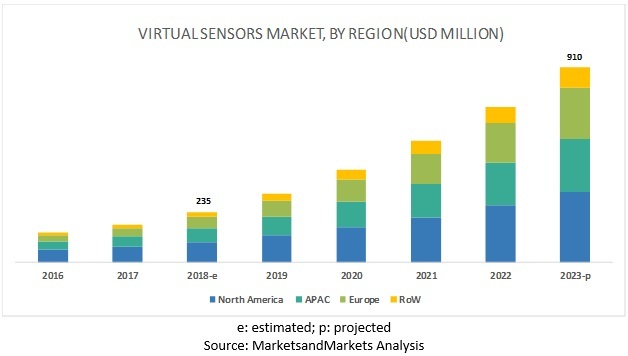 [97 Pages Report] MarketsandMarkets expects the global virtual sensors market size to grow from USD 235 million in 2018 to USD 910 million by 2023, at a Compound Annual Growth Rate (CAGR) of 31.1% during the forecast period. The major growth drivers for the market, include predictive maintenance and potential reduction in the time and cost compared to physical sensors, and rising adoption of the IoT cloud platforms. Virtual sensor solutions help organizations to estimate product properties or process conditions based on mathematical models. The mathematical models estimate the desired values based on the inputs from the multiple physical sensors. Organizations use virtual sensors mainly to achieve efficiency and in geographic locations where physical sensors cannot be implemented Vendors in the market offer virtual sensor solution as standalone software or integrated with comprehensive solutions to provide an advanced feature. The solution helps enterprises estimate accurate measures when the physical sensor is too slow. Virtual sensors enable organizations to reduce operational expenses as the implementation and maintenance of physical sensors are expensive. The cloud segment is expected to grow at the highest CAGR during the forecast period. Cloud deployment has enabled businesses to operate without a server infrastructure or office location, thus, enabling employees to work remotely. Cloud deployment of virtual sensors helps cut down the total cost of ownership and increase data storage capabilities for organizations. Organizations use the cloud-based virtual sensor, as it is easy to deploy, offers agility, and provides more scalability than on-premises software at an affordable cost. These factors are supporting the growth of the cloud-based virtual sensor. Cloud-based deployment also offers use-based pricing models, which enables organizations to pay cloud service vendors only when the services are used, which further reduces upfront capital expenditure related to hardware, software, storage, and technical staff. In the process industry, mainly manufacturing and utilities segment, industrial digitalization is one of the important criteria for optimizing the manufacturing processes of robots, industrial machines, and processing set-ups. However, virtual sensors along with AI and IoT have been adopted by process industry-manufacturers or Original Equipment Manufacturers (OEMs) as the use of these technologies collectively enables machinery designing without using design prototypes, process optimization, remote monitoring, and timely data delivery in the manufacturing plants, which is an important factor that drives the virtual sensors market for discrete industries. Virtual sensor solutions are used to implement an enterprise asset management and life cycle service strategy, which has been majorly beneficial for both the OEMs and the owner-operators. North America is expected to hold the largest market size and dominate the global virtual sensors market from 2018 to 2023. The region majorly has a high concentration of large multinational companies, which largely contribute to the growth of the market. APAC is expected to provide lucrative opportunities for the virtual sensor solutions vendors, owing to the increasing demand for the virtual sensor solutions among enterprises in the region. The increasing number of government regulations and compliances in various regions could affect the adoption of virtual sensor solutions. GE has established itself as a strong brand among the leading players in the virtual sensor market by launching innovative solutions required for various industries. The company offers virtual sensors in a digital twin that works on the Predix platform to provide asset and system intelligence. Predix is a cloud-based platform which is used to power industrial apps. This platform also derives outcomes ranging from the reduction of unplanned downtime to improved asset output and operational efficiency. The company keenly focuses on developing cost-effective and easy-to-deploy innovative technology solutions and adopts both organic and inorganic growth strategies. For instance, in January 2019, the company launched Digital Ghost, an active cyber-defense solution for industrial control systems. Digital Ghost helps organizations protect critical infrastructure and systems network by creating an additional layer of security and combines GE’s Digital Twin and edge computing technologies to monitor systems. Furthermore, in November 2018, launched Predix Edge to help businesses simplify edge-to-cloud computing and enable them to secure the progress of their Industrial Internet of Things (IIoT) initiatives from pilot to production. In January 2019, GE launched Digital Ghost, an active cyber-defense solution for industrial control systems. Digital Ghost helps organizations protect critical infrastructure and systems network by creating an additional layer of security and combines GE’s Digital Twin and edge computing technologies to monitor systems. In September 2018, Cisco signed an agreement with the Indonesia government as part of Cisco’s global Country Digital Acceleration Program. According to this agreement, Cisco helps the Indonesia government accelerate its digitalization agendas and provide beneficial services to their citizens. In March 2019, Honeywell launched Honeywell Marketplace to help organizations find and purchase innovative software solutions, technologies, and services and, enable them to improve productivity and increase efficiency. In Juen 2017, Siemens launched new Version 14 of the TIA Portal in Southeast Asia. This version would shorten the time to market for machine manufacturers and increase the productivity of end user industries. This version is supplemented with a wide range of new functionalities for the digital enterprise and Industry 4.0 requirements. A SIMATIC S7-1500 controller can be simulated as a digital twin with this version of PLC Sim Advanced. What are the major challenges faced while deploying virtual sensor solutions in different application area? Where and to what extent organizations need virtual sensor solutions? What are key industry trends in virtual sensor market? What are the challenges faced by virtual sensor solutions providers while integrating innovative technologies with a client’s existing IT infrastructure? 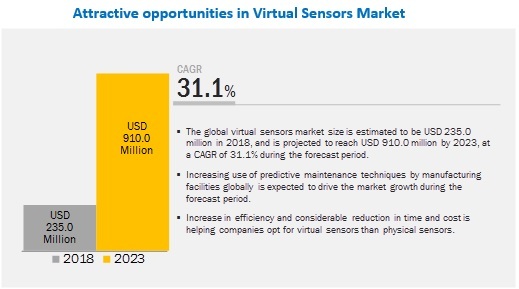 The study involved 4 major activities to estimate the current market size for virtual sensors market. Exhaustive secondary research was done to collect information on the market. The next step was to validate these findings, assumptions, and sizing with industry experts across the value chain using primary research. Both top-down and bottom-up approaches were employed to estimate the complete market size. Thereafter, the market breakup and data triangulation procedures were used to estimate the market size of the segments and sub segments of the market. The virtual sensors market comprises several stakeholders, such as virtual sensor vendors, end-user companies, digital twin software vendors, software providers, system integrators, compliance and regulatory authorities, cloud service providers, resellers and distributors, research organizations, government agencies, enterprise users, technology providers, venture capitalists, private equity firms, and startup companies. The demand side of the market consists of enterprises across various end users comprising oil and gas, automotive and transportation, process industry - manufacturing and utilities, electrical, electronics and consumer technology, healthcare, chemical, and aeronautics and defense. The supply side includes virtual sensor software providers offering virtual sensor solutions and services. Various primary sources from both the supply and demand sides of the market were interviewed to obtain qualitative and quantitative information.